The State Flexibility Act would not go as far as the Ryan plan, which proposes a massive overhaul of the Medicaid funding structure. But it would allow states to take a knife, if not a hatchet, to the program….Having already made steep cuts to provider payments and benefits, “some states will certainly make eligibility cuts,” says Edwin Park, VP for health policy at the Center for Budget and Policy Priorities. This is, obviously, one way to cut healthcare expenditures: just provide healthcare to fewer people. Preferably the poorest and sickest, since they don’t contribute to political campaigns and aren’t very reliable voters. On a less cynical policy level, it’s also worth noting that although there are lots of programs that are best handled at the state and local level because local officials understand local conditions better, healthcare really isn’t one of them. Sick is sick, and treatment for chronic diabetes doesn’t change much from California to Mississippi. What’s more, Medicaid expenses always rise during recessions (more poor people = more Medicaid), which is also when state revenues crater and cutbacks are inevitable. This not only hurts sick people with low incomes, it makes economic turndowns even worse than they have to be. 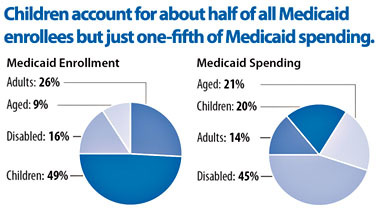 So let’s just federalize Medicaid. Medicare works fine on a national level, after all, and during a recession the federal government can fund higher Medicaid expenses automatically by running a bigger deficit. It’s a nice automatic stabilizer that not only helps the poor and the sick but helps the economy too. What’s not to like?